The Yellow-Faced Bumblebee (Bombus vosnesenskii) is a large, fuzzy, black and yellow bumblebee. In fact, it is the most common West Coast native bee species and can be found along the coast from Canada down into Baja California. Unlike the majority of California native bees who are solitary, these bees are colony formers. They build their nests in the ground typically in vacant gopher or squirrel holes but will also form nests under shrubs, leaf litter, wood piles, compost piles, or in human-made nest boxes. Each colony contains one queen, breeding males, and non-breeding female workers. Their colonies usually range from 200-300 members. The first eggs that are laid in the colony are female workers who, once hatched, will help tend to new larvae and forage for pollen and nectar to bring back to the nest. The last eggs of the season will be new queens and males who will create the next generation of champion wildflower pollinators. Not only are bumblebees important in the pollination of native plants but they are also highly valued by the agriculture industry. This is especially so in the production of greenhouse tomatoes where this species is used as a primary pollinator. In greenhouse settings, studies have proven these species to be more effective at pollinating tomato flowers than the hand pollination method. Because many flowers in the family Solanaceae, like tomatoes, have anthers that are closely bound, a special technique is required to release the pollen. Bumble bees have developed a technique called buzz pollination where the bee latches on to the anthers and buzzes its wings in such a way that causes vibrations that release the pollen. Check out this great video that shows bumblebee buzz pollination in action. In the garden these bumblebees are always a welcome sight. Unlike European Honey Bees and wasps, bumblebees are typically not aggressive and would need to feel highly annoyed or threatened for a sting to be provoked. So if a curious bumblebee comes buzzing your way, don’t be afraid, just stand still and admire or walk away slowly. Their peaceful presence is more than appreciated by wildflowers and pollinator enthusiasts alike! They are generalists in terms of where they get their nectar and pollen and thus can be found visiting a wide variety of native and non-native flowers, but they do tend to prefer natives. 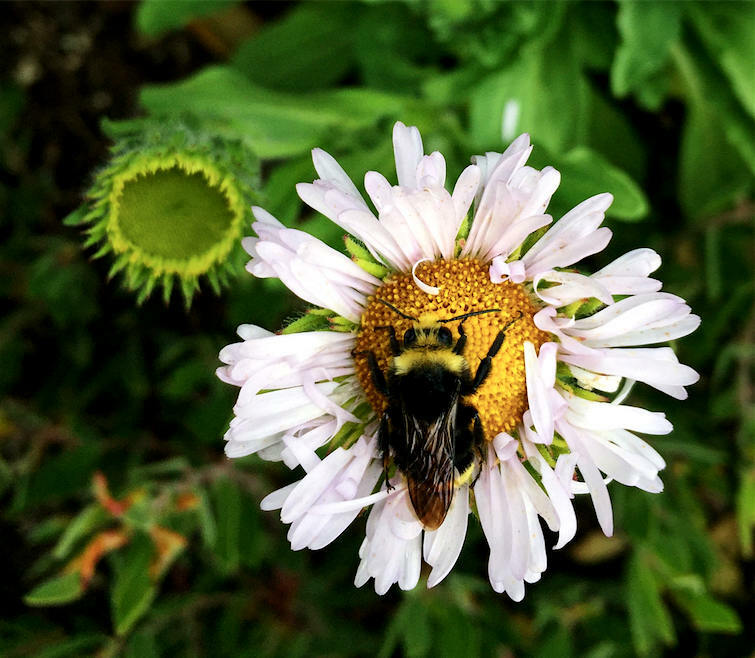 If you’d like to invite more of these bees into you garden, try planting some of their favorite natives, like Yarrow, Monkeyflower, Penstemon, Seaside Daisy, Sages, and of course California Poppy!